1-CD with 48-page booklet, 33 tracks. Playing time approx. 76 mns. I Can't Find The Doorknob, Love Me, Sweet Singing Daddy, and The Fun Is Over. Accompanying this set is a 48-page booklet with many never-before-seen photographs, as well as a biography and discography by Andrew Brown. For a brief period of time in the mid-fifties, the singing duo of Jimmy Lee and Johnny Mathis seemed poised to become the latest in the long line of performers to make a major commercial breakthrough from the stage of the 'Louisiana Hayride'. However, personality conflicts and disagreements combined with the carefree, unpredictable nature of Johnny Mathis undermined the duo's success from the very beginning, and after their upbeat If You Don't, Somebody Else Will peaked at #6 on 'Billboard's' country charts in late 1954, the pair never regained their momentum. Frustratingly, Jimmy and Johnny became identified as one-hit artists, a cruel and hardly-appropriate label incongruous to the consistent quality of all their subsequent recordings. 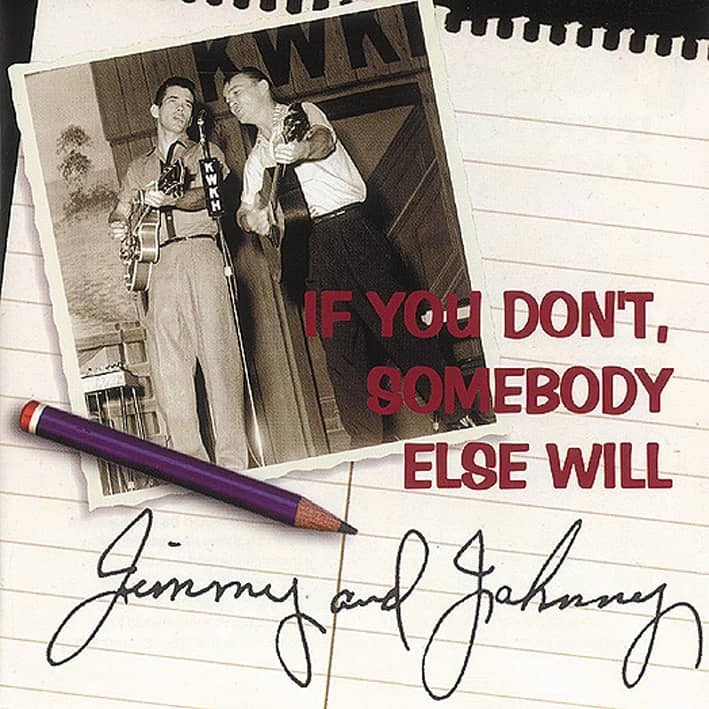 Since they recorded a somewhat large amount of material over a six-year period beginning in 1954, the enduring impression has been that Jimmy and Johnny were together all those years. Such was not the case. The original duo of Jimmy Lee and Johnny Mathis were together for less than a year in 1954-55. When Mathis quit the duo in January 1955, Jimmy recruited his younger brother Lynn to be 'Johnny'. This act recorded numerous sides for Decca from late 1955 until 1957, when Lynn left. There would be several more Jimmy and Johnny releases to follow over the next few years (with 'Johnny' being the original Johnny Mathis), yet these were studio-only duets. Although they continue to pursue music to this day, as a recording duo Jimmy and Johnny faded after their final release in 1961. 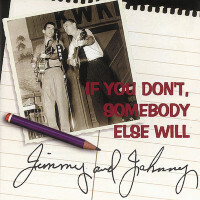 For the first time, this CD collects together nearly all of Jimmy and Johnny's original recordings, from their Chess and Decca sides to the smaller independents like D, Vin, and Republic. It is a consistently satisfying body of music, ranging from the purest country to the most energetic rockabilly, belying the erratic and circumstancesl nature under which most of it was recorded. With his quiet, serious demeanor, James Walton Fautheree hardly gives the impression of someone who spent nearly half of his life on stage. The third of five children, Jimmy was born on April 11, 1934, while his family was living in Smackover, Arkansas. During the depression, oil was about the only stable business there was in the Southwest, and Jimmy's oilman father had to move his family from town to town as jobs came up. The Fautherees moved all around Texas and Louisiana, even California, throughout the late thirties and forties before finally settling in Dallas around 1946. "I grew up in entertainment", Jimmy says. "I was singing, tap dancing before I could talk. My aunt bought me a guitar when I was about eleven or twelve. My parents wanted me to be an entertainer." Unlike most white Southerners at the time, Jimmy's father disliked both hillbilly and pop music, preferring black rhythm and blues and boogie-woogie, and he encouraged his son to learn how to play blues. "My daddy used to say, 'Boy, you ain't never gonna get nowhere til you learn to play that blues' I used to stay up late at night and listen to boogie-woogie on WLAC out of Nashville. Later on I'd go to downtown Dallas...listen to the colored people play on the sidewalks in Deep Elm. I learned something from 'em, I hope." Eventually Jimmy started listening more to hillbilly music, however, and he cites Hank Williams, Ernest Tubb, and Jack Guthrie as formidable influences. Perhaps the most influential of all country performers to Jimmy, however, was Merle Travis, whose distinctive 'finger-picked' electric guitar style left the greatest impression on him. "He was the one". Jimmy says. "I was around fourteen when I first heard Merle. It took me five years to get that guitar style down. I played it with a straight pick first...later I learned how to play it with my thumb. I got to meet Merle in 1950 when he played in Dallas at the Round-Up Club. He came down on his motorcycle from California. He brought his Bigsby (guitar) with him, and he let me play it some there. He didn't mind taking up a little time with you. Nice fella." Jimmy was not yet sixteen when he became a regular on the 'Big D Jamboree', the popular weekly radio show held at the Dallas Sportatorium, after winning their amateur contest in early 1950. The 'Jamboree' had only been going for a couple of years, but was already established as the premier showcase for country music talent in Texas by the time Jimmy joined. One of the promoters there told Jimmy his last name was too long, and suggested he use the name 'Jimmy Lee' for stage appearances. The name stuck. It was also at the 'Jamboree' that Jimmy met another up-and-coming young performer on the Dallas scene named Johnny Mathis. The two immediately struck up a friendship, though forming a singing duo was still a long way off. By the time Jimmy Fautheree first met him, John Wesley Mathis -- better known as 'Country' Johnny Mathis -- was already a fairly well-known country singer and songwriter around Dallas. He was born September 28, 1930 (not 1933, the year usually cited) in Maud, Texas, a tiny community deep in the Northeast Texas piney woods. The son of a minister, Johnny's earliest recollections of music revolve around church singing and gospel music. He remembers his first childhood encounter with a guitar as a near-mystical experience. "We lived way out in the country and my dad was the pastor at this little country church", he says. "And he came home with a guitar one day -- it was just an old, beat-up guitar -- and the way the wind was blowin' through those strings...it captured me. I loved that guitar, man." Johnny recalls that he learned how to play by "watching other guitarists make a certain chord progression. I'd memorize it 'til I got hold of my guitar, then I'd start workin' on it. But I didn't have time back then to really learn how to play -- I was on the go." The Mathis family moved to Dallas around 1939, and whatever musical leanings Johnny had were solidified after being exposed to the cowboy, hillbilly, and swing music being broadcasted daily over the local stations. Nonetheless, Johnny states that his biggest musical influence was a steel guitar-playing member of his father's church. "His name was W.J. Vandagriff, but everybody called him 'Slim'", Johnny says. "That man could sing...Lord have mercy. They said that before he got saved, he'd set out there in the East Texas woods, on them stumps, yodelin' all night long while the whiskey was a-making. He showed me how to take a regular Spanish guitar and change the tuning using a knife, so I started playing it that way. I was about eleven or twelve when he was teaching me this. I had the gift for it, I just didn't cultivate it. But I guess my inspiration was Brother Slim Vandagriff. There's not any like him anymore." Customer evaluation for "If You Don't, Somebody Else Will"
Superb harmonies, excellent music all round - The sleeve note are comprehensive too!